For the A113 road in England, see A roads in Zone 1 of the Great Britain numbering scheme. A113 (sometimes A-113, A1-13 or A11-3) is an inside joke, an Easter egg in media created by alumni of California Institute of the Arts, referring to the classroom used by graphic design and character animation students including John Lasseter, Tim Burton and Brad Bird. Bird first used it for a license plate number in the "Family Dog" episode of Amazing Stories. It has appeared in other Disney movies and every Pixar movie. Bird said, "I put it into every single one of my films, including my Simpsons episodes—it's sort of my version of Hirschfeld's 'Nina.'" Classroom A113 is currently the first year graphic design studio. American Dad! – Stan's neighbor's license plate when he pulls into church, in Season 1, Episode 7, "Deacon Stan, Jesus Man" at 1:40. American Dad! – The license plate of the red 'Hummer' car, in Season 8, Episode 1, "Love, American Dad Style" at 2:13. American Dad! – On a boxcar rode by a hobo former co-worker of Stan's, in the Season 9, Episode 18 "Permanent Record Wrecker" at 19:13. American Dad! - The license plate number of car driving by, in Season 12, Episode 8, "A Whole Slotta Love" at 5:16. American Dad! – The number on the side of the second carriage of the miniature train, in Season 12, Episode 12, "The Shrink" at 15:31 and twice more at 18:54 and 19:28. American Dad! – The number can be seen on the clapperboard during the production of "Marble Trouble," in Season 12, Episode 10, "A Star is Reborn" at 11:55. Aqua Teen Hunger Force – Carl's prison number, in Season 11, episode 9, The Greatest Story Ever Told. BoJack Horseman – Briefly seen on a classroom door during BoJack's drug trip in Season 1, Episode 11 "Downer Ending". The "Family Dog" episode of the Amazing Stories series. It is on the license plate of the red van. It is also on the top of the clipboard the cop holds. Family Guy – In the crossover episode with The Simpsons, "The Simpsons Guy", A113 is a license plate number for the police cruiser of Chief Clancy Wiggum at the car wash held by Homer Simpson and Peter Griffin to find the Griffins' stolen car. Family Guy – In the episode, "A Lot Going on Upstairs", the number is shown on Lois' driver license that Stewie brings to preschool in his dream. 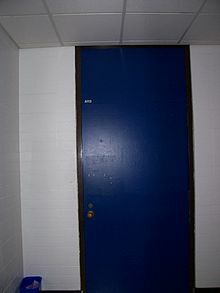 Harvey Birdman, Attorney at Law – In "Deadomutt Part 1", Birdman is moved to office 113-A (which is really a restroom). Rugrats – In "Little Dude," Season 1, Episode 4, the room number of the Home Economics class. The Powerpuff Girls – The number of the Stealth Fighter when Blossom flies as she reaches and touches the tail with her hand. The Simpsons – Krusty the Clown's prison uniform number, in episode 12 of Season 1, "Krusty Gets Busted", at 10:45. The Simpsons – Sideshow Bob's mugshot number, in episode 2 of Season 5, "Cape Feare", at 9:30. The Simpsons – Sideshow Bob's prison uniform number, in episode 9 of Season 7, "Sideshow Bob's Last Gleaming", at 4:30. The Simpsons – Mug shot of Bart Simpson from "Do The Bartman." Tiny Toon Adventures – In Tiny Toon Adventures: How I Spent My Vacation, when Plucky and Hamton arrive at Happy World Land, a license plate reads "A-113" on one of the cars in the parking lot. South Park – On the side of a helicopter in the episode "Prehistoric Ice Man", "A-113" is clearly visible. Bobby's World – In the episode "The Visit to Aunt Ruth's", the number on the card of Bobby's imaginary mugshot. The Adventures of McGee and Me! – In the episode "The Big Lie," A113 is seen as the license plate number for the paddy wagon that takes away a small child in an animated vignette. Whatever Happened to... Robot Jones? – In the episode "Work", Robot Jones enters a Gym and matches the unit number of the spotter robot he is to help remove with the unit number on his checklist, "A113". The Zeta Project – In the episode "Remote Control", Bucky has a rocket ship labeled A113 in his room. We Bare Bears – A classroom is labeled "A113" in the episode "Money Man." Uncle Grandpa – In "Broken Boogie" and "Doctor Visit" A113 can be seen. The Loud House – In "Tea Tall Heart" and "The Loudest Thanksgiving" A113 can be seen. Doctor Who – In "Flatline", the ninth episode of the eighth series, the first train carries the headcode A113. Firefly – In episode two, "The Train Job", the registry number of the train is A113. Supernatural – In The first episode of Season 5 "Sympathy for The Devil", the number of the hospital room where Bobby is recovering is 113A. Quantico – In the first episode of Season 1 "Run", the room which Caleb Haas was staying in before he flunked out was numbered 113A. Terra Nova – In "Genesis (Part One)", the security camera showing Jim Shannon in unauthorized areas is labeled "CAM A113". Toy Story trilogy – License plate number on Andy's mom's cars (a minivan in Toy Story and Toy Story 2, and a Crossover in Toy Story 3). Airport announcement for "LassetAir Flight A113" (also a reference to director John Lasseter) in Toy Story 2. A Bug's Life – Code on cereal box as Flik enters the bug city. Monsters, Inc. – One of the pillars inside the company reads "A13". The stars also make the marking A 113 after Randall gets thrown in the door. Finding Nemo – The model number of the camera used by the scuba diver. Cars franchise – In the first film, it is the number on Trev Diesel, the freight train that Lightning McQueen outruns while he is first on his way to Radiator Springs. Trev Diesel was also made as a carrying case for the die-cast line and has A113 on it. It is Mater's license plate number in the related short film Mater and the Ghostlight, Cars Toons, and other Cars merchandise. The minor character Dexter Hoover's diecast version has license plate number "A113CA". And the beginning of the image file name for the leader of the lemon cars. In the second film, it is the number on Siddeley's tail (shown as A113), as well as on Mater's license plate again. On the tail of the plane in the airfield that Mater and McMissile escape on. In Cars 3, the Number is used as a room number placed on the sliding door of Sterling's office. Ratatouille – Git, the lab rat, has a tag on his left ear that reads "A113". Also, when Linguini is watching TV while sleeping, A113 also appears on a train behind the love couple. WALL-E – The code for the directive given to Auto to never return to Earth, the first (and currently, only) time A113 had any real significance to a Pixar film's plot. It also seems to spell out part of WALL-E's name, WA11-3 (partial Leet). Also, when Eve and WALL-E arrive on the Axiom, as they leave the docking bay, the doors are marked Deck A-224 – 1 added to each digit of the reference. Up – The number of the court room that Carl Fredricksen goes to after he hits a worker to protect his mailbox. Brave – written in Roman numerals (ACXIII) above the interior of the door to the witch's cottage. Monsters University – The lecture hall where Mike and Sulley have their first class has this number on the door. Inside Out – When Riley is walking up a street in San Francisco going towards the bus, she stops to see who is calling her. In the building in the background, "a113" is written in graffiti on the building. When Riley Anderson heads to her new school in San Francisco, she is put in room A113. The Good Dinosaur – When the bird chases Arlo out of his feeding area, "A113" is formed by sticks along the fence in the right side of the frame. Finding Dory – The license plate for the cargo truck that is taking the animals to Cleveland has the license plate "CALA113". Also, the tags of the two sea lions, Fluke and Rudder, are labeled "A1" and "13" respectively. Coco – The number appears on the Bureau of Family Grievances door and on the cover of one of Ernesto de la Cruz's albums. Incredibles 2 – At the end of the film, the Parrs about to drop Violet and Tony off at a movie. On the marquee, the film is called Dementia 113, but one side makes it appear to read Dementi A113, which is a reference to the film Dementia 13 by Francis Ford Coppola. Also, the room where Elastigirl checks The Screenslaver footage at DevTech is room A113. The model number for the out-of-control hovertrain includes A113. The International Superhero Accord document number is ISHA CA-A113. The number spray painted on a dumpster is BUNI-A113. The Book of Life – At the beginning of the film one of the school buses is numbered A113. Tomorrowland – At the start of the film when the screen reads: "An A113 Production". Neighbors – When Seth Rogen is fighting Zac Efron it is visible on the transmission box. The Hunger Games: Catching Fire – At the bottom right corner of the monitor when President Snow is watching Katniss decide whether to kill someone in the arena. Alpha and Omega – On the back of Garn and Debbie's truck, seen when Humphrey is talking to Marcel and Paddy. The Iron Giant – License plate on car partially eaten by the Giant; the 3 is bitten off. Also in Dean's house there is a painting which has A113 on it. Lilo & Stitch – License plate number on all vehicles, including Cobra Bubbles' rental car, Captain Gantu's spaceship, Nani's car, fire truck, tanker truck, and license plate in Lilo's room (used in Stitch's model of San Francisco). Also in direct-to-video film Leroy & Stitch. Ralph Breaks the Internet - A113 appears above a door while Vanellope von Schweetz is trying to escape from Stormtroopers. Bugs Bunny's Lunar Tunes – In the scene with the Key Witness, one of the videos the Witness shows is "Satellite View A-113." The Brave Little Toaster – The apartment number where "The Master" lives. Mickey, Donald, Goofy: The Three Musketeers – The license plate number of the carriage that has Mickey held as captive. The Princess and the Frog – A trolley is labeled number A113. Big Hero 6 – Appears as a part number on the schematics for Wasabi's energy blades as Hiro builds it. Meet the Robinsons – The license plate of Cornelius 'Lewis' Robinson's adoptive parents. Planet 51 – License plate on Lem's car is A113. Mission: Impossible – Ghost Protocol – Josh Holloway's character Hanaway's weaponized "class ring" has A113 emblazoned on the side. It is Tom Cruise's character Ethan Hunt's extraction access code given over the phone and is on the plate of a car in front of the Kremlin during the big explosion, time at which the bomb's deactivation button is pushed "1.13 seconds". The Avengers – A113 can be seen in the top left corner of all news clips near the end of the film, when the world reacts to the revelation of the Avengers. Also seen in the bottom right hand corner of Nick Fury's Helicarrier Glass Screens. Rise of the Planet of the Apes - A113 can be seen at one point. Dawn of the Planet of the Apes – The virus that wipes out most of humanity is called ALZ-113. The Colony – Inside the storage area a box has A113 as its registration number. Saving Mr. Banks – Walt Disney looks at the travel itinerary of P.L.Travers as she flies from Los Angeles to London. Her flight number is BTA-113. Sausage Party – License plate on the back of Druggie's car along with the sticker "DIXAR". Spider-Man: Homecoming – A113 can be seen in the top left of the Spider Drone HUD when it is first initiated at Washington Monument. In Prototype, the poison Bloodtox is officially written as Substance A-113A though pronounced A1-13 Variation A. In A Vampyre Story, it is the position of Mona's grave. In Back to the Future: The Game, it is a convention booth. In Beyond: Two Souls, it is the number of a room in the building Jodie grows up in. In Kinect Rush: A Disney-Pixar Adventure, it is on a license plate in the 'Day Care' part of the game. In Lego The Incredibles, it can be seen on numerous buildings fronts both in Municiberg and New Urbem, as well as on the side of the ship where the Anchor-Man is hiding. In Outlast, it is the name of a locked room in the earliest stage of the game. In Sunset Overdrive, it is seen while Walter is working on his glider during a cutscene. The easter egg is once again encountered in the game's DLC, where it can be seen on the new glider in the end of the introduction mission cutscene. In Destiny, it is the name of an unknown area on the Dead Orbit Ghost fragment Grimoire card. In Fallout 4, it can be seen on one of the gas station signs in the gameplay demo and in the Brotherhood of Steel Cambridge computer logs. In War Thunder, it was included as a decal with certain event vehicles. In Supertuxkart, A1-13 can be seen written on the entrance door of Oliver's math class one of the race track. In Kingdom Hearts III, A113 can be seen as the number of the license plate of Andy's Mom's Mini Van, and a street name sign in the Toy Story world "Toy Box", as well as being seen above a shutter door in the Monsters, Inc. world "Monstropolis". 12 - occasionally used in Avengers films. 19 – often seen in the works of Stephen King. 27 – often used in "Weird Al" Yankovic's videos and music. 37 – used several times in the movies of Kevin Smith. 42 – The Answer to Life, the Universe, and Everything, first used by Douglas Adams in The Hitchhiker's Guide to the Galaxy. Seen in several productions. 47 – often repeated in many Star Trek and JJ Abrams productions. 83 – often used in the TV series How I Met Your Mother by Barney. 114 – appearing in two of Stanley Kubrick's films. 1138 – appearing in several George Lucas productions. AE-35 — from Stanley Kubrick's 2001: A Space Odyssey, often appears in science fiction films and television series. Marc Brown hid the names of his two sons, Tolon and Eliot, in all but one of his Arthur books. Goroawase, a common Japanese language stylistic recourse in which numerical codes representing words are created with syllables that can be used to pronounce each numeral. ^ a b c d "A-113 Appearances in The Simpsons". blog.bcdb.com. Retrieved 29 June 2015. ^ a b c d Koch, Dave (May 29, 2014). "Of A113, Pizza Trucks and Future Heroes: Pixar Easter Eggs". Big Cartoon News. Retrieved May 29, 2014. ^ Flatline: Fact File BBC One, retrieved 19 October 2014. Quote: "One of the train's featured in Flatline is clearly numbered A113. This designation is often featured in films created by former students of California Institute of the Arts, referring to the classroom used by graphic design and character animation students. As such, A113 has appeared (with varying degrees of subtlety!) in TV shows such as The Simpsons and Family Guy plus movies including Toy Story, Monsters University and The Hunger Games: Catching Fire." ^ Finding Nemo (Motion Picture). Emeryville, CA: Pixar. 2003-05-30. Event occurs at 14:52. ^ the second post by the user "Nexas"
^ Cars (Motion Picture). Emeryville, CA: Pixar. 2006-06-09. Event occurs at 23:01. ^ Mater and the Ghost Light (Short). Emeryville,CA: Pixar. 2006-11-07. Event occurs at 4:58. ^ Ratatouille (Motion Picture). Emeryville, CA: Pixar. 2007-06-29. Event occurs at 1:11:##. ^ WALL-E (Motion Picture). Emeryville, CA: Pixar. 2008-06-27. Event occurs at 1:08:48. ^ WALL-E (Motion Picture). Emeryville, CA: Pixar. 2008-06-27. Event occurs at 0:38:50. ^ "Easter Eggs in Pixar's UP". SlashFilm. 2009-06-01. Retrieved 2009-06-01. ^ "More 'Brave' Easter Eggs – A113, The Late Joe Ranft". The Pixar Times. 2012-11-15. Retrieved 2013-07-13. ^ "Big Hero 6 – Walt Disney Studios Animated Features". findingmickey.com. Retrieved February 26, 2015. ^ "Jayse Hansen Portfolio | Avengers Helicarrier Fury's Glass Screens | Jayse Hansen Portfolio". jayse.tv. Retrieved 29 June 2015. ^ "Ghost Fragment: Dead Orbit – City Factions". Archived from the original on 2015-03-21. Retrieved 2015-03-19. This page was last edited on 27 March 2019, at 18:56 (UTC).